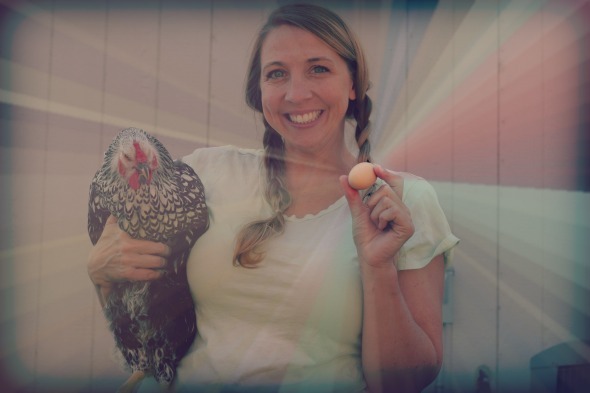 You are here: Home / Homesteading / Chickens / The First Egg! The First Egg! First came the chicken and now after many sleepless nights finally the EGG! I was jumping up and down and squealing with delight when I first saw it. My husband of course remarked it the most expensive egg he’s ever paid for… but forget him. I finally have an EGG! Lacey was showing some real signs that she was going to lay. All day she kept going up into the nesting boxes, scratching around and sitting there for awhile. After awhile she would come down, and I would run over to see if she laid. Nope. Then she would go back up and repeat the whole process again and again. Eventually I stopped looking for a few hours. Then I walked back to the coop and found the egg on the ground!! 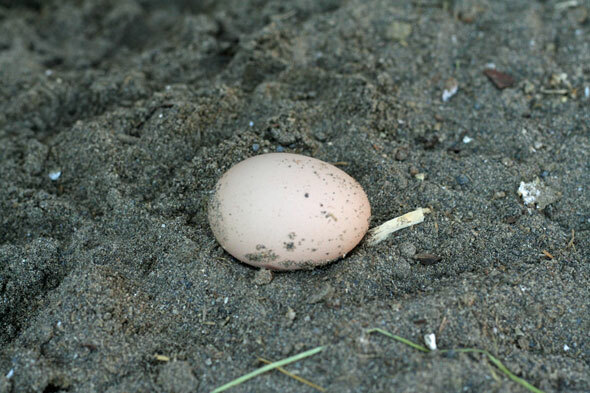 Even though she didn’t lay it in her nesting box… it was still fun to find! I mean, just look at that beautiful egg! The kids were very excited about the egg and after a few biology lessons disappointed that this egg wouldn’t turn into a little chick. It’s always fun to explain how the egg came out and from where. I gave Lacey lots of love all the rest of that evening – she had a tough first day of laying, but she did it!! 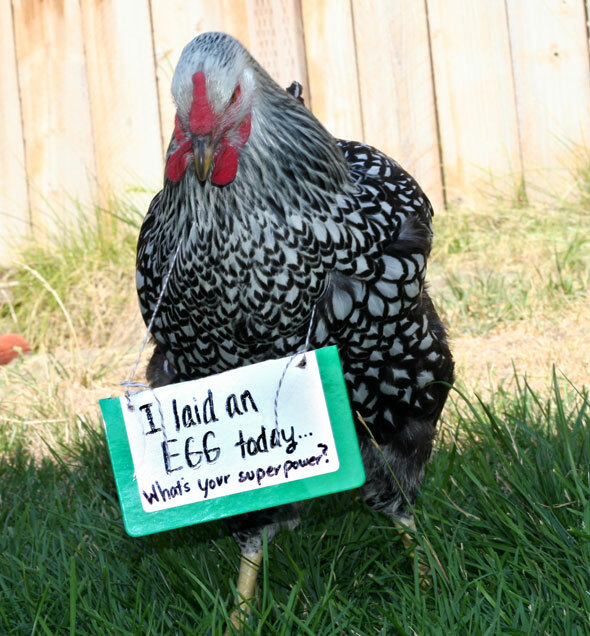 So..the big question was what to do with the first egg? Who gets to eat it? I really just want to frame it. And it seems a little scary to eat the egg. I know it sounds weird, but we only have purchased white eggs in the past. So once we get a few eggs coming I am going to make something for all our family to enjoy. And we will all take that step together. This is SOOOO exciting!! My heart is so full with thanks to the Lord for blessing my life through the joys of His beautiful creations. 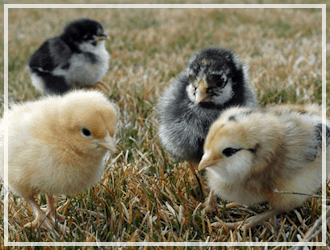 I have realized that these 4 little chickens have brought something into my city life – something wonderful, fun and something to create many memories with my family. Thank you all for encouraging me, giving me advice and kindness along this journey and also reading along with my adventures. I feel so happy! I am so blessed. Tis a good day friends. A good day. Yay!! I have a chicken that was bocking really loud, like never before. She is almost 6 months old and i don’t know if she is going to lay.Was Lacey bocking really loud or unusual ? How old was she when she laid it? Thanks for your help ! 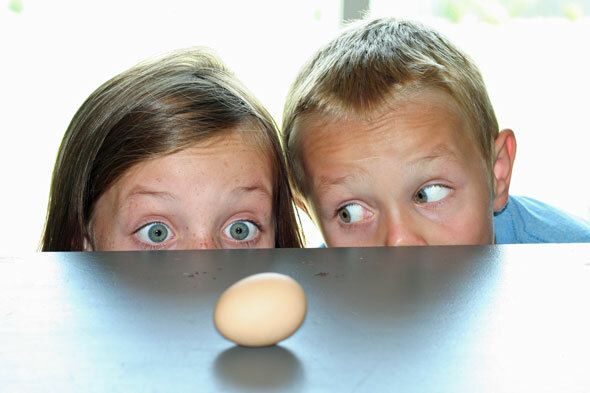 in Europe eggs are Not refrigerated at all, not even in the stores. they ARE in the US because all eggs are washed and this wash washes off the natural protection from the eggs. We have had chickens in our town backyard since spring and they are laying too. I love nothing more than scooping up those precious little eggs to pop straight into the frying pan in the morning. 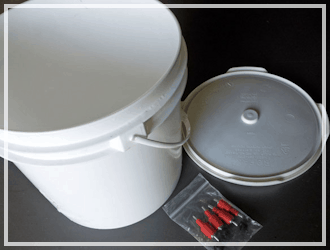 It IS fun – though the hubby does have a point about cost! Still, free range organic eggs at our local grocer are $7/doz. That adds up quickly! Plus, they aren’t fresh at all. Likely weeks old by the time they hit the shelves. Our cat got two of our chicks right off the bat, so we only have two left and they share space with our two little bunnies, but I am working on a huge chicken coop at our land. Can’t wait to have a flock of “girls” out there! Super fun! (Non-chicken people just don’t get it though, haha). Oh totally!!! So sorry your cat got your chicks…it’s always rough to lose them. Congrats on your first egg! I know that’s an exciting feeling! YEAH!!!! EXCITING!! We have blown out lots of our first eggs and then the kids have decorated them and we can see how tiny they started out compared to the woppers we get now!! We have even blown out some of our firsts from our new set of hens. They started laying end of July while we were gone. My kids love how tiny they are….they all fight “I get the tiny one!” It is quite hilarious! FUN FUN FUN!!! They taste sooo delicious! Also, just to add to the above comment about wiping them down. Make sure you don’t wash your eggs when you bring them in-they’ll last longer that way. They’ll go bad much faster if you wash them. I just rinse mine right before I crack them open. Enjoy! 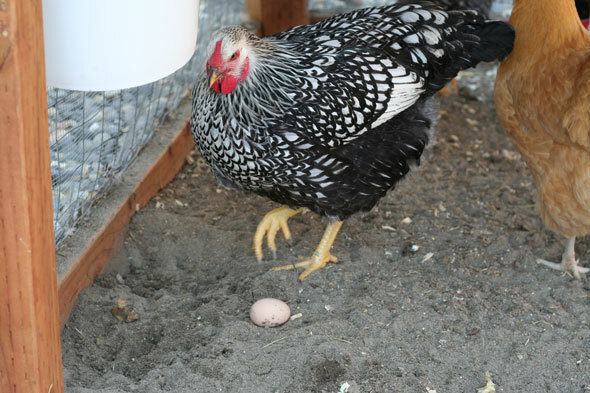 She should lay her next egg at roughly the same time since chickens are pretty much clockwork when it comes to laying their eggs. 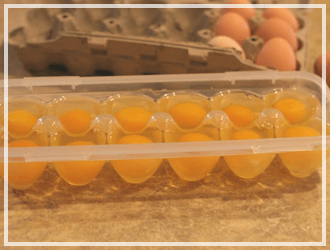 Mmm… fresh chicken eggs, how do I miss fresh chicken eggs with deep orange yolks. Congrats on your first egg. I don’t think I’ve ever had a fresh egg so I wouldn’t know the difference. Just read through the comments and I had no idea you could keep eggs on the counter (no refrigerated). I guess that makes sense-they obviously don’t come out cold. Way to go, have only been following you for a short time, but I to got carried away by your excitement! Good stuff! Have you ever blown out an egg? If you do that you can keep your egg shell forever in tact and still have scrambled eggs with it. That’s what I’m gonna do Laurel..great idea! Yeah, our egg is a bit small, but oh so cute. Will make sure we wipe it before we use it, thanks! Congrats on your first egg, it’s a beauty! 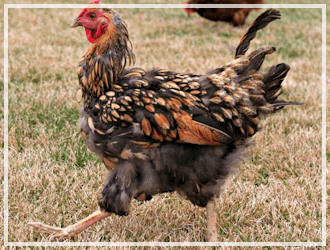 We’ve been debating on getting some hens and I have a question. Are they noisy or smelly? We have a bit of space between us and the neighbors, but I don’t want to make anyone mad. I am in the city, and if you clean the coop out once a week they are not really smelly to me. None of my neighbors have complained about the smell. 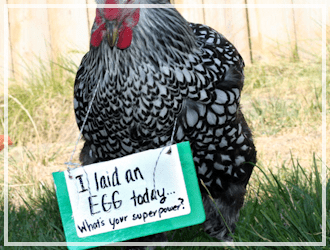 As for the noise…honestly I have one chicken who is noisy, the rest are pretty quiet. The noisy one likes to boc boc when she wants out of her coop ( I usually let them out for a few hours every day in the backyard). She is just spoiled though..I think if your chickens were always cooped up there would probably not be as much noise. I guess it depends on the chicken. Good to know. We are in a semi-country setting so we are spaced out a little. 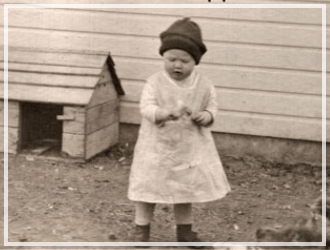 I know my kids would LOVE to have chickens, just want to stay in good graces of the neighbors! In seeing this first egg and loving the whole Process, I just had a first about eggs a few weeks ago. Some friends whipped up some scrambled eggs. They added a dash of milk, eggs, goat cheese and fresh mozzarella but the best flavor was obtained by cooking it on a low heat instead of high and they were delicious. Usually they are rubbery so found out secret is low heat.